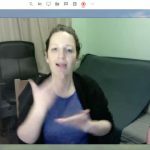 Kate Rowley presents the webinar: How do Deaf children develop sign language? Kate Rowley is an experienced teacher and has taught sign language acquisition for many years now. Kate has also worked as a researcher for the last 9 years focusing mainly on language disorders in sign language, language and identities of deaf young people and is now doing a PhD looking into literacy processes in deaf adults. Following a degree in Deaf studies, Kate completed an M.A in linguistics and an MSc in Psychology Research Methods at UCL. She is currently undertaking a PhD looking into the reading abilities of deaf and hearing adults using eye-tracking technology.